John Edwards and David Lee have been jailed for their part in brutal assaults and a kidnapping in Morecambe and Lancaster. Four men who brutally assaulted one man and kidnapped another in Morecambe and Lancaster to enforce drug debts have been jailed for a total of more than 50 years. On September 5 last year the group, from the Merseyside area, forced their way into an address on Sefton Road, Morecambe and demanded money from the occupant, a 44-year-old man. They slashed him to the face, head and hands and hit him with a baseball bat before fleeing the scene. Danny Noon and Damien Yates have been jailed for their part in brutal assaults and a kidnapping in Morecambe and Lancaster. 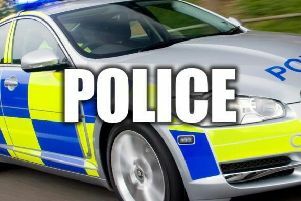 Shortly afterwards they drove to Lancaster city centre where they forced a vulnerable 39-year-old man into their car before they assaulted him and threatened to take him to Liverpool where he would be subjected to further harm. This incident happened in broad daylight and was witnessed by members of the public who were able to provide police with part of the vehicle registration number. The vehicle was then spotted in Lancaster city centre and quickly stopped by officers where all four men were arrested. At Preston Crown Court John Edwards, 29, of Monfa Road, Bootle was sentenced to 19 years and four months for wounding with intent and kidnap and David Lee, 32, of Kevins Drive, Kirkby was sentenced to 19 years and four months for wounding with intent and kidnap. Danny Noon, 19, of Askern Road, Liverpool was sentenced to eight years and nine months and Damian Yates, 29, of Melbourne Court, Liverpool was sentenced to nine and a half years, both for unlawful wounding and kidnap. Brett Gerrity for the CPS said: “This gang of four men travelled approximately 60 miles from Liverpool to Morecambe and Lancaster in order to carry out extremely violent attacks on two men to enforce drug debts. “The defendants Edwards and Lee having wounded the first victim ‘high fived’ each other in celebration. This was followed by the kidnap in broad daylight in Lancaster which was the second on a ‘to do’ list of criminality that day. “The prosecution team presented a case which clearly demonstrated the role played by each of the defendants. It has resulted in them today being given significant custodial sentences by the court. Detective Inspector Mark Dickinson said: “These attacks were carried out in broad daylight, one in a busy city centre, and displayed extreme violence. The impact on both the victims, people who witnessed the incidents and the wider community is significant. I would like to thank all those who reported what they witnessed to the police and assisted us with our investigation.